I did a lot more shopping in October; the fall weather made me want to relook my wardrobe and ensure I have what I need to keep warm in my chilly office. Ever since I discovered some "mixed media" tops in my Stitch Fix, I've been on the hunt for them. So I definitely picked up layering and faux layered pieces in order to stay warmer and also effortlessly put together. Merona Open Layering Cardigan in light grey heather (originally $23, paid $18): I was looking for a comfy open cardigan, as layers are key in the fall. I bought this one in both heather and black, but the dark color of the black made the appearance of bulk so I returned it. I like the "mullet" cut (lolz) in that I don't have tons of fabric making my backside look larger, and I still get the swirly layered look in front. There was a 25% off sweater sale, and I got free shipping with my RedCard. Merona Favorite Cardigan in gold heather (originally $23, paid $18): I've ALWAYS had a mustard colored cardigan. Always, in my book it's a basic. And then after a while, it falls apart from wear. I've repaired them in the past to the point of no return! So this is a hole in my closet I've been trying to fill since last fall. And if I find a mustard ponte knit blazer, I will cry tears of joy and BUY THEM ALL. LOFT Spacedye Relaxed Mixed Media Top (originally $45, paid $27): I loved this top on Fran, and as you can tell from my past Stitch Fix posts, I'm really into comfy tops that have visual interest/layers, so I can throw them on with jeans or pants and make it work for a business casual setting. I honestly hadn't considered LOFT for a while, and now I don't know why! Given that with sales you can get the tops for much better prices than I've been paying via Stitch Fix, it actually tempts me to quit my subscription knowing I've learned where to find things on my own/via reading blogs and following favs on Instagram. LOFT Button Back Mixed Media Top (originally $45, paid $27): This top has a great button back detail, without having to button/unbutton it for wear! I like that it seems unexpected, and it is super comfortable to wear. 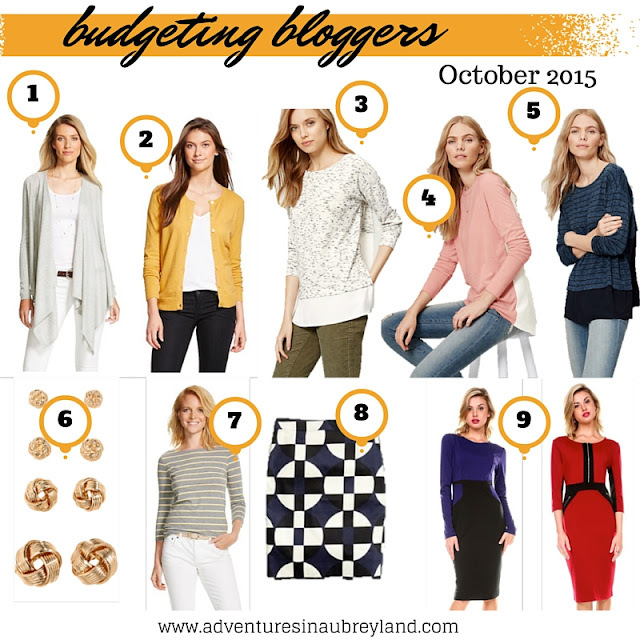 These tops are ideal for my chilly office and unpredictable fall weather. LOFT Stripe Relaxed Mixed Media Top (originally $45, paid $27): In pure Aubrey fashion, I got the same top in two colors/patterns. H&M Earrings ($4): I needed some gold toned studs, and I liked that these were cheap and came in varying sizes to match whatever I wear. Simple and easy. Merona Button-front Slub Shirt ($12): This basic tee was so soft, and it incorporated my favorite fall color (mustard). I figured it would be great under some of my quilted vests in chillier weather, as well as for under my new mustard cardigan! It's definitely a keeper, and I won't hesitate to buy more in the future. J. Crew Factory Printed Pencil Skirt (originally $85, paid $20 via Poshmark): I had a $5 credit on Poshmark, so I was randomly browsing and found this skirt brand-new with tags. I bargained for it and got it for $20. It may be very "blogger circa 2013", but I think it's a great piece that I can try to style for work. Stanzino Long-Sleeve Dress in Navy and Zipper Dress in Burgundy (usually $30 each, $18 and $17): I bought these super-cheap long-sleeve dresses to use for work meetings and DAR events. I honestly expected to have to return them, but they're not bad for cheapies! Overall, I got a TON of stuff but still didn't break the bank. Next month, I have my Stitch Fix coming in, and I'm contemplating buying a leather bag/tote on Etsy... While I love designer bags, I just haven't found the durable everyday bag that I want, so I'm nervously considering custom! Don't forget to check out the rest of Fran's Budgeting Bloggers here, and shop my Poshmark closet!